The Cassini spacecraft orbited Saturn from June 30, 2004, until Sept. 15, 2017, when the probe ended its life with a plunge into the ringed planet's atmosphere. The mission is known for discoveries such as finding jets of water erupting from Enceladus, and tracking down a few new moons for Saturn. 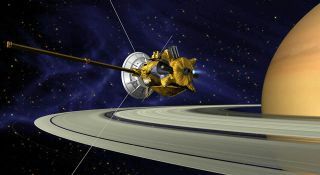 Cassini is a joint project among several space agencies, which is a contrast from the large NASA probes of the past such as Pioneer and Voyager. In this case, the main participants are NASA, the European Space Agency and Agenzia Spaziale Italiana (the Italian space agency). Cassini was the first dedicated spacecraft to look at Saturn and its system. It was named for Giovanni Cassini, a 17th-century astronomer who was the first to observe four of Saturn's moons — Iapetus (1671), Rhea (1672), Tethys (1684) and Dione (1684). Before this spacecraft came several flybys of Saturn by Pioneer 11 (1979), Voyager 1 (1980) and Voyager 2 (1981). Some of the discoveries that came out of these missions included finding out that Titan's surface can't be seen in visible wavelengths (due to its thick atmosphere), and spotting several rings of Saturn that were not visible with ground-based telescopes. It was shortly after the last flyby, in 1982, that scientific committees in both the United States and Europe formed a working group to discuss possible future collaborations. The group suggested a flagship mission that would orbit Saturn, and would send an atmospheric probe into Titan. However, there was a difficult "fiscal climate" in the early 1980s, NASA's Jet Propulsion Laboratory noted in a brief history of the mission, which pushed approval of Cassini to 1989. "Titan is an especially interesting target for exploration because the organic chemistry now taking place there provides the only planetary-scale laboratory for studying processes that may have been important in the prebiotic terrestrial atmosphere," the report added, meaning that on Titan is chemistry that could have been similar to what was present on Earth before life arose. Cassini's development came with at least two major challenges to proceeding. By 1993 and 1994, the mission had a $3.3 billion price tag (roughly $5 billion in 2017 dollars, or about half the cost of the James Webb Space Telescope.) Some critics perceived this as overly high for the mission. In response, NASA pointed out that the European Space Agency was also contributing funds, and added that the technologies from Cassini were helping to fund lower-cost NASA missions such as the Mars Global Surveyor, Mars Pathfinder and the Spitzer Space Telescope, according to JPL. Cassini also received flak from environmental groups who were concerned that when the spacecraft flew by Earth, its radioisotope thermoelectric generator (nuclear power) could pose a threat to our planet, JPL added. These groups filed a legal challenge in Hawaii shortly before launch in 1997, but the challenge was rejected by the federal district court in Hawaii and the Ninth Circuit Court of Appeals. To address concerns about the spacecraft's radioisotope thermoelectric generators, which are commonly used for NASA missions, NASA responded by issuing a supplementary document about the flyby and detailing the agency's methodology for protecting the planet, saying there was less than a one-in-a-million chance of an impact occurring. Cassini didn't head straight to Saturn. Rather, its mission involved complicated orbital mechanics. It went past several planets — including Venus (twice), Earth and Jupiter — to get a speed boost by taking advantage of each planet's gravity. The nearly 12,600-lb. (about 5,700 kilograms) spacecraft was hefted off Earth on Oct. 15, 1997. It went by Venus in April 1998 and June 1999, Earth in August 1999 and Jupiter in December 2000. Cassini settled into orbit around Saturn on July 1, 2004. Among its prime objectives were to look for more moons, to figure out what caused Saturn's rings and the colors in the rings, and understanding more about the planet's moons. Perhaps Cassini's most detailed look came after releasing the Huygens lander toward Titan, Saturn's largest moon. The lander was named for Dutch scientist Christiaan Huygens, who in 1654 turned a telescope toward Saturn and observed that its odd blob-like shape — Galileo Galilei had first seen the shape in a telescope and drew it in his notebook as something like ears on the planet — was in fact caused by rings. The Huygens lander descended through the mysterious haze surrounding the moon and landed on Jan. 14, 2005. It beamed information back to Earth for nearly 2.5 hours during its descent, and then continued to relay what it was seeing from the surface for 1 hour 12 minutes. In that brief window of time, researchers saw pictures of a rock field and got information back about the moon's wind and gases on the atmosphere and the surface. This first panorama of Titan released by ESA shows a full 360-degree view around the Huygens probe. The left-hand side shows a boundary between light and dark areas. The white streaks seen near this boundary could be ground 'fog', as they were not immediately visible from higher altitudes. Huygens drifted over a plateau (centre of image) and was heading towards its landing site in a dark area (right) during descent. One of the defining features of Saturn is its number of moons. Excluding the trillions of tons of little rocks that make up its rings, Saturn has 62 discovered moons as of September 2012. NASA lists 53 named moons on one of its websites. A huge ring, 8 million miles away from Saturn, likely made up of debris from Phoebe. Saturn has not gone ignored, either. For example, in 2012, a NASA study postulated that Saturn's jet streams in the atmosphere may be powered by internal heat, instead of energy from the sun. Scientists believe that heat brings up water vapor from the inside of the planet, which condenses as it rises and produces heat. That heat is believed to be behind jet stream formation, as well as that of storms. Cassini was originally slated to last four years at Saturn, until 2008, but its mission has been extended multiple times. Its last and final leg was called the Cassini Solstice Mission, named because the planet and its moons reached the solstice again toward the mission end. Saturn orbits the sun every 29 Earth-years. With Cassini's mission lasting 13 years, this meant that the spacecraft observed almost half of Saturn's seasonal change as the planet went around its orbit. In 2016, the spacecraft was set on a series of final maneuvers to provide close-up views of the rings, with the ultimate goal of plunging Cassini into Saturn on Sept. 15, 2017. This strategy was designed to protect Enceladus and other potentially habitable moons from the (small) chance of Cassini colliding with the surface, spreading Earth microbes. Ring-grazing orbits: Every week between Nov. 30, 2016, and April 22, 2017, Cassini did loops around Saturn's poles to look at the outer edge of the rings, to learn more about their particles, gases and structure. It also observed small moons in this region, including Atlas, Daphnis, Pan and Pandora. On April 22, 2017, Cassini made the final flyby of Titan. The flyby was done in such a way to change Cassini's orbit so that it began 22 dives (once a week) between the planet and its rings. This was the first time any spacecraft explored this zone, and it entailed some risk because the orbit brought it between the outer part of the atmosphere and the inner zone of the rings (where it is at risk of striking particles or gas molecules). On Sept. 15, 2017, Cassini made a suicidal plunge into Saturn, taking measurements for as long as its instruments could make communications back to Earth. Some of the science Cassini performed during this period included creating maps of the planet's gravity and magnetic fields, estimating how much material is in the rings, and taking high-resolution images of Saturn and its rings from close-up. The spacecraft made an interesting discovery from its new vantage point. It found that Saturn's magnetic field is closely aligned with the planet's axis of rotation, which baffled scientists because of how they think magnetic fields are generated — through a difference of tilt between the magnetic field and a planet's rotation. As of late July 2017, however, scientists planned to gather more data to see if perhaps Saturn's internal processes confused their measurements. Shortly after the spacecraft's demise, Cassini mission planner Erick Sturm told reporters he planned to write a report about what he and his team learned after operating a mission for such a long time. While enthusiasm kept the scientists going through the long years (which sometimes required working during the holidays or in the middle of the night), engineering was also key. Kim Steadman, an engineer on the Cassini team for 14 years, said that redundancy was essential. She said that a reaction wheel and some of the probe's thrusters failed during the mission, which would have meant the spacecraft couldn't point its instruments to collect data, or communicate with Earth through pointing its antenna at the planet. However, Cassini's mission continued because it had backups. The team plans to issue the report to help with future spacecraft planning; one of those recommendations might be including a gas gauge. Cassini died with about 1 percent of its fuel left, but lead propulsion engineer Todd Barber told Space.com that he had a tough time estimating how much fuel was left in Cassini; he had to do so through various indirect methods. This meant that during the final months, Barber was slightly nervous about maneuvers requiring propulsion, since there was a margin of error for his calculations and didn't know if there was enough fuel remaining to carry them out. The mission may be over, but science results will continue to flow for decades because not all of the information has been analyzed yet. NASA also continued to release new photos from the spacecraft even after Cassini had died. In late September 2017, for example, the agency sent out a photo of Enceladus — a target of high interest due to the many geysers on the moon's surface. SPRITE (Saturn Probe Interior and Atmosphere Explorer), which would deliberately fly into Saturn's atmosphere to look at its composition and structure for roughly 90 minutes. Cassini lasted only a couple of minutes during its plunge, but it was not designed for this work. Oceanus, which is designed to look at Titan's potential for habitability by examining organic molecules "through the methanologic cycle and assessing exchange processes between the atmosphere, surface and subsurface," according to a project description presented at the 48th Lunar and Planetary Science Conference in The Woodlands, Texas. Dragonfly, which would make periodic flights in Titan's atmosphere to look at organics on its surface, in several locations. Enceladus Life Finder, which would fly through plumes multiple times to collect and characterize the molecules that are there — particularly complex organic compounds that could indicate precursors of life. Enceladus Life Signatures and Habitability, of which little has been released publicly. It may be targeting the plumes of Enceladus, which were examined periodically by Cassini during flybys. The winning candidate among the 12 proposed New Frontiers missions (the other missions target Venus, the moon or comets) will be selected in mid-2019 for launch no later than 2025. However, there is a semifinal selection; NASA will select two or three of these proposals before then for further study, ahead of making the final decision.